There is no doubt that the French adore their butter, but this is next level. We’re in the vast kitchen belonging to Jerome Galis, famed chef-turned-celebrity farmer, and he is advising everybody assembled to slather homemade truffle butter thickly over pieces of crusty French bread, as though it were a rustic pâté. A sprinkle of fleur de sel and fresh shavings of truffle completes the mouthful, a flavour explosion of rich dairy, nutty bread and the earthy black pearls, grown just mere meters away in Galis’ personal truffle farm. This is where Fabrice Vulin, executive chef of The Tasting Room in Macau’s City of Dreams, has spent the afternoon, surveying and searching for black truffles with Galis and his trusty hunting dog, Gina. Vulin has known Galis for the best part of two decades and trusts him as his primary supplier of black winter truffles and Provence asparagus. At his farm down in the south of France (somewhere between hectares upon hectares of petit oak trees (many of them smaller than two meters) shade the rich bounty hidden in the earth below—as Vulin makes his way down the rows, following Gina’s excited tail wagging, Galis explains what to look out for. A telltale crack in the soil indicates the presence of the truffles as they swell, taking in the moisture and nutrients from the surrounding earth, he tells us. Gina barks excitedly and is rewarded with a treat, and Vulin gets to work, kneeling down to gently break the soil with his hands to reveal a small, juvenile truffle—it is only autumn, and it has some way to go yet until it reaches its prime come winter. “We struggled to follow [the dogs] as they move so quickly, sniffing here and there,” laughs Vulin. “You can be sure that when they start scratching at the ground that there is a 99% chance that there will be a truffle below. Dig in, and straight away you will have that smell that surrounds you.” To Vulin, the scent of the truffle and the undergrowth brings back some of his fondest childhood memories—perhaps, this is one reason why he insists on trying the product at its source, before bringing it to the dining table at The Tasting Room. 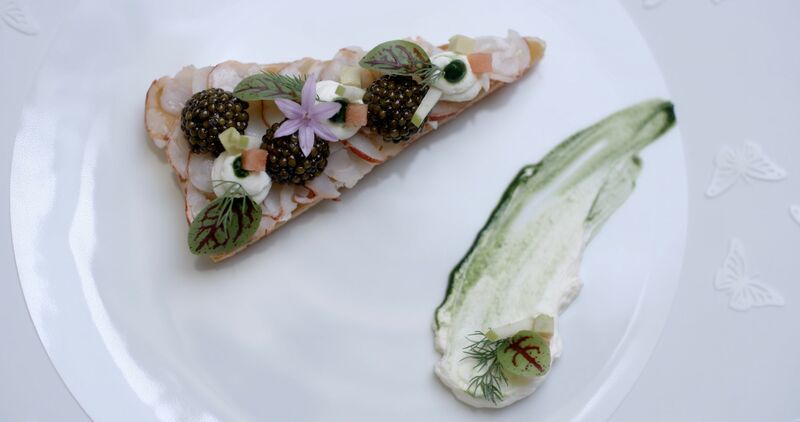 While items such as truffle and caviar are used as luxurious garnishes for his signature creations, to Vulin their sourcing is as important as that of the primary ingredient. For most of the dishes utilising caviar at The Tasting Room, Vulin insists on Kaviari—a slick, family-run operation was one of the first in the world to adopt eco-conscious production methods while maintaining high quality caviar products. They are involved every step of the way, from assessing the quality of the water to the harvesting of the eggs alongside fish farmers. The eggs are then matured in the Kaviari labs by a caviar master, whose role is not unlike that of a cellar master. For Vulin, everything is tasted and trusted, completing the journey of an ingredient from the source to the table. Perhaps, this is the real definition of luxury, which extends beyond the prestige and pedigree of the products themselves.